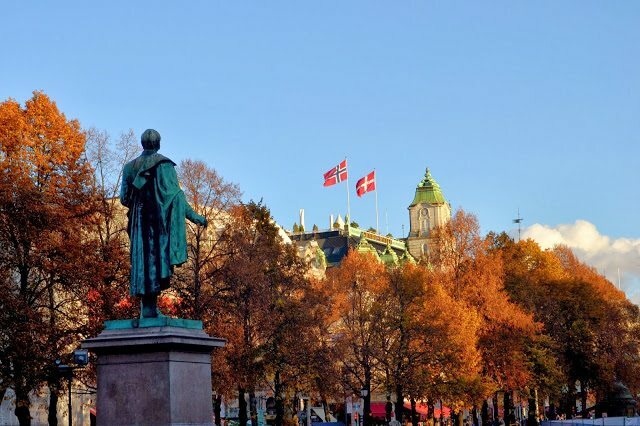 Thom and I visited Oslo on a budget after finding some very cheap flights to Oslo, Norway through Skyscanner and put the destination as ‘everywhere’ then clicked on the cheapest flight outside of the UK and booked it. This is actually one of my favourite things to do because who doesn’t love a cheap holiday somewhere? Of course, Oslo isn’t the first place you think of when you think “cheap European city break”. And sure, it’s never going to be super cheap to visit Oslo, but you can still visit Oslo on a budget. If you’re planning a trip to Oslo and are looking for things to do in Oslo on a budget then consider this your Oslo travel guide for an Oslo city break! Is the Oslo City Pass worth it? Want to read more about Oslo? Oslo is the capital of Norway and is a very modern and diverse city. It’s very easy to get around Oslo on foot, or by bike in the summer and the public transport is good too (and free with the Oslo city pass!). It’s one of the world’s greenest cities and has been named European Green Capital for 2019. There are mountains, fjords, sea, history, food, coffee, culture. Basically, Oslo has everything a city should. Oslo is towards the south-east of Norway not too far away from the border with Sweden. I won’t lie and tell you that Oslo isn’t expensive but I was to show you that it’s still possible to visit Oslo without breaking the bank. Sure you can go all out and eat at the fanciest restaurants, stay at 5* hotels and get taxis everywhere but you don’t need too. 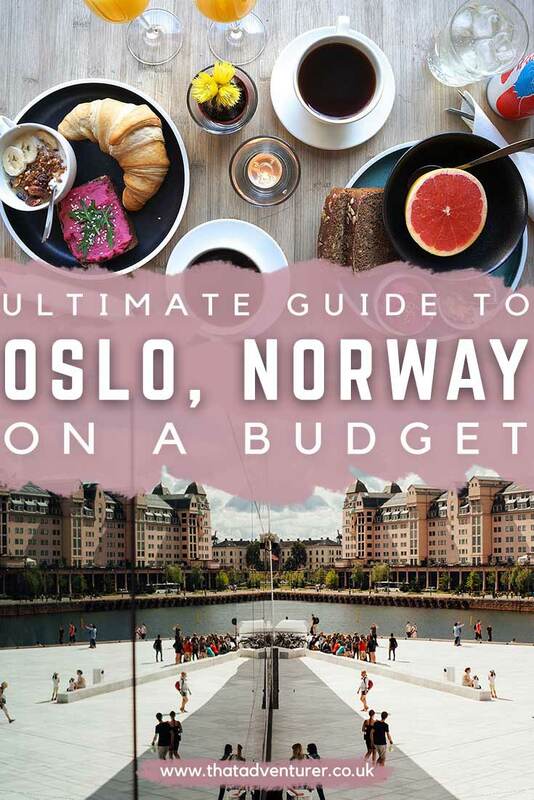 You can definitely visit Oslo on a budget. By far the easiest way to keep your trip to Oslo cheap is to buy the Oslo Pass. The Oslo Pass is a card for tourists that gives you free entry to 30 museums and attractions, free travel on all public transport for the duration of your pass, free entry to outdoor swimming pools, free walking tours, discounts on Oslo sightseeing and more. I’d definitely say it’s worth it! We bought a three day Oslo City Pass for our weekend in Oslo. It covers some of the best places to see in Oslo such as the Holmenkollen Ski Jump and the transport to get you around the city as well as top Oslo tourist attractions. You can buy an Oslo Pass online before your trip, at select hostels and hotels in Oslo and the Oslo tourism office. See a full list of sellers here. The best way to get to Oslo from the UK is to fly and luckily flights to Oslo are super cheap! You can find super cheap flights from London to Oslo. Some one-way tickets are even under £5!! However, while the flights themselves are super cheap, the airport you’ll land at with budget European airlines is over 30km away from Oslo city centre. A return train ticket to Oslo costs just over £40 and takes about 45 minutes. You can book this in advance with Omio. 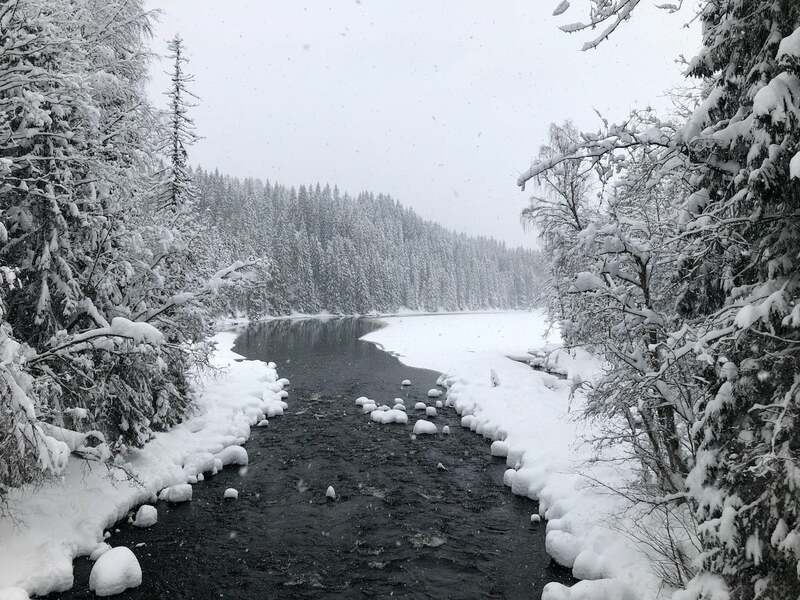 Even still your flights and train ticket to Oslo train station can come in at just £50 making getting to Oslo pretty darn cheap! Getting around Oslo is super easy as public transport in the city is great. The public transport network, Ruter, covers the city of Oslo as well as the surrounding county of Akershus. One ticket will cover you for this whole network and is valid on buses, trams, subways, ferries (except the Bygdøy ferry) and local trains. See ticket prices here. If you’re buying an Oslo Pass (which I highly recommend) then all your public transport for the duration of your pass in zone 1 & zone 2 is free. This also includes the ferry to the Bygdøy museums. We found this very useful during our trip to Oslo. If you’re travelling solo in Oslo and looking for cheap accommodation in Oslo, Norway then check out these hostels. Anker Hostel is one of the best places to stay in Oslo on a budget. It’s just over £30 for a bed in a dorm and is only 10 minutes’ walk from Oslo city centre. Plus, all rooms have a private bathroom. There’s also the Anker Hotel which scored 9.7/10 on Hostelworld. It’s a great option if there’s a group of you travelling to Oslo and looking for a private room. Saga Poshtel is the place to stay for a trendy, chic, vibrant and homely atmosphere. It’s newly renovated and is the perfect hub for backpackers in Oslo. Beds start at £30 a night. Cochs Pensjonat is the top rated hostel in Oslo on Hostelworld. It’s more of a hotel since they do twin rooms rather than big dorms and it’s one of the best budget hotels in Oslo. The cheapest rooms have shared bathrooms and for slightly more you can get a private bathroom. Rooms start at £70. If you’re looking for the best hotels in Oslo on a budget, here are my top recommendations for hotels in Oslo city centre that won’t cost you a fortune. This boutique hotel in Oslo is in a great location and is one of the top hotels in Central Oslo. The apartment comes with a flat-screen TV, kitchen and dining area, and a private bathroom. It sleeps 4 and costs about £120 which is a bargain when split between 4 people. This super stylish hotel is one of the coolest Oslo budget hotels. There’s a TV in every room, a great city room and a private bathroom. It also includes a breakfast buffet at the restaurant across the street which is a great way to save money during your trip to Oslo. The interior of this hotel is beautiful and it gets great reviews too making it one of the best hotels in Oslo Norway. On top of the usual amenities, there’s a rooftop terrace, a hotel gym and a lounge with pinball machines, PlayStation and darts! If you’re looking for what to do in Oslo then look no further! The Oslo Opera House is one of the top Oslo attractions and is at the centre of Oslo’s rapidly developing waterfront. It cost around €500 million to build and opened in 2008. It’s right next to the main train station so it was one of the first things we saw in Oslo. Take a wander all the way around the building and admire the views! In the hip, Grünerløkka area of Oslo is some of the city’s best tapas. There are all the dishes you’d expect such as croquettes, meatballs, plenty of ham and manchego cheese. It’s delicious and popular with locals. If you’re hungry during your visit to the Holmenkollen Ski Jump then make sure to pop into Frognerseteren. It’s a little bit of a tourist trap but it’s also a great place to try some reindeer and other Norwegian delicacies. Go to the self-serve cafeteria area for a more affordable meal! If you can, try and grab a seat upstairs overlooking the woods. However, you’ll have to visit at a strange time, or be prepared to wait it out, as these seats always seem to be full! Towards the west of central Oslo is the sloping park of Slottsparken. It was one of Oslo’s first public parks and is filled with hills, meadows, a few ponds and plenty of trees. It’s home to one of the Norwegian Royal Family’s houses and is a great place to take a wander, or picnic on a nice day. Thom and I visited Liebling one morning for brunch during our visit to Oslo and it was one of my favourite places to visit in Oslo. I still remember it perfectly to this day! It’s a Berlin-style cafe which means that the food on the menu is more Germanic than Norwegian but tasty either way! There are pastries, cakes, great coffee and wine for later on in the day. Plus there are board games and a swinging chair just for fun! If you like doing something while you drink then you’ll love Oslo Camping. Here you can play the 18-hole mini golf course while you drink cheap beer and hang with the locals. Opened in 2013, Ekebergparken is a vast forested Oslo park which overlooks the city. It’s full of art and is an interesting place to explore and a stroll here makes a great free thing to do in Oslo. This museum is housed in a building that looks like a sail which fits in perfectly with the Oslofjord landscapes that surround it. Even if you’re not a big art fan, it’s worth heading over this way just to admire the architecture of the building. I remember there being some very, very strange artworks in here! Wear your comfy shoes and head out along the Akerselva river which should be on everyone’s list of what to see in Oslo. This 8km long river goes from the Maridalsvannet lake and out into the Oslo Fjord. There’s a path right along the river and it’s one of the most beautiful spots in the city (especially at sunset!). The castle of Akershus Festning was constructed centuries ago in order to protect the city from invaders. Nowadays it still dominates the harbourfront and offers an interesting look into the history of the city. 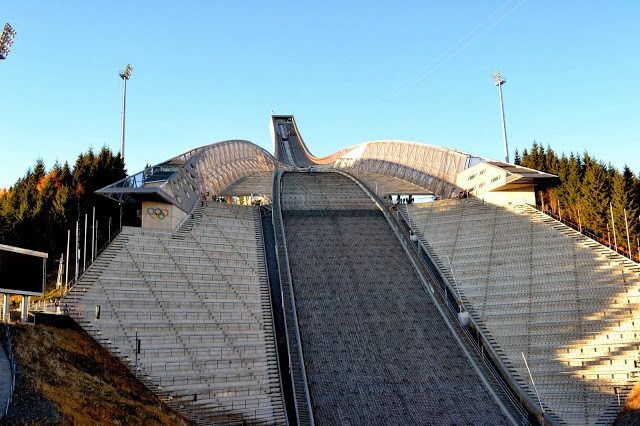 Perched on top of a hill overlooking Oslo, the Holmenkollen Ski Jump is one of the best things to see in Oslo. It’s just 20-30 minutes from the centre and iup here you get a great view of the city and the fjords. The ski jump plays host to some of the world’s best ski jumpers in March for Oslo’s annual ski festival. There’s also a ski museum and a few other things to do here. The best part is entry is free to the museum with the Oslo City Pass! Read more about my Oslo guide to the Holmenkollen Ski Jump. A former industrial area has been turned into a big food court: Mathallen Oslo. 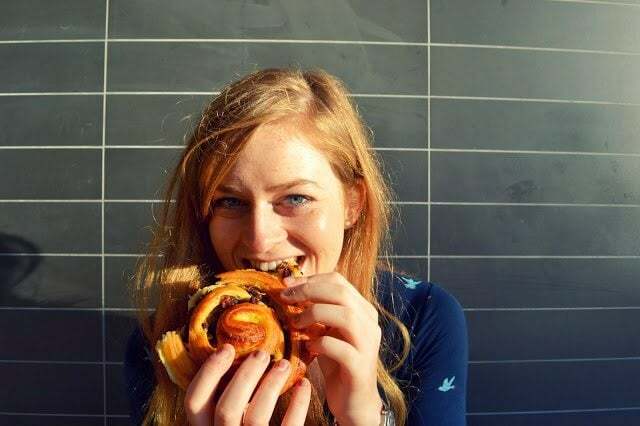 Inside you’ll find Norwegian regional cuisine sold at delis, restaurants and cafes. It’s a great spot for lunch and dinner and the atmosphere is great no matter what time of day you visit. The beloved woodland of Oslo locals is Nordmarka. 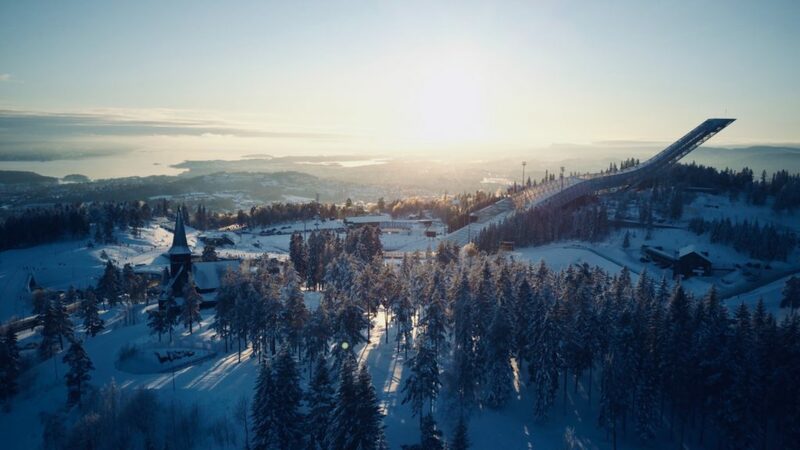 It sits to the north of the Holmenkollen Ski Jump and is the go-to spot for hiking, biking, sledging and skiing and is a very popular place to visit in Oslo, Norway. To get there take the train to the end of the line at Frognerseteren and follow the signposted walking route. This shop sells coffee, food from around the world and travel essentials such as bags and books (in English too). 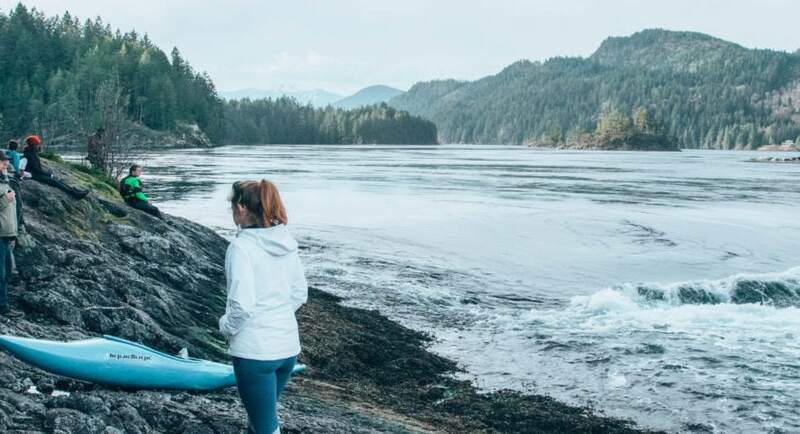 If you’re a keen traveller you’re going to love it here! Fuglen is one of the city’s best coffee shops. There’s a great choice of coffee blends and tea too. At night this place turns into a cocktail bar – what more could you want?! Grünerløkka is renowned for being the hipster area of Oslo and makes for some fun sightseeing in Oslo. It has a great nightlife and is packed with bars, restaurants and places to dance! The Oslo Cathedral has very impressive stained glass windows and an incredible painting ceiling too. It’s worth a visit just to gaze in awe at the decoration. The Øya Festival is the largest rock and indie music festival in Norway. It’s also super green! All four festival stages are powered with renewable energy, rubbish is recycled, and all sewage generated is converted into bio-fuel to fuel the buses taking people between central Oslo and the festival grounds. AMAZING! Frognerparken has big lawns, ponds, and plenty of space to chill out and is one of the top Oslo sights. There’s also Vigelandsanlegget which home to the Oslo sculpture park. This cafe is run by an award-winning barista, Odd-Steinar Tøllefsenis, who was named the World Brewers Cup Champion in Sweden in 2015. It’s a welcoming place that serves espresso-based coffees, drip or hand-filters (J60 or Chemex), and you can watch the beans being roasted while you drink if that’s the way you roll. Make sure you put the Norwegian Royal Family’s home on your “Oslo, what to see” list! This Royal home is in Slottsparken and is relatively modest (for a palace!). Still, with 173 rooms it’s not exactly your everyday building. You can play and pose just metres from the main entrance and in the summer there are guided tours available too for a closer look. However, make sure to book in advance. Everyone knows at least one Edvard Munch painting. ‘Scream’ is perhaps his most famous and you can see more of Munch’s paintings at the Munch Museum. The Munch museum is one of the top Oslo places to visit and the exhibitions are constantly changing. You can do a guided tour in English every day in July and August to learn more about Munch and his art. Another popular coffee roaster in Oslo is Tim Wendelboe. This micro roastery is run by World Barista Champion and World Cup Tasters Champion Tim Wendelboe. I think it’s fair to say you’re in safe hands when it comes to your daily caffeine fix. Aker Brygge is a melting pot where people meet, mingle and visit. People come to shop, eat and drink, catch a boat to the islands or eat very fresh seafood! Another thing to add to your “what to do in Oslo, Norway list” is to visit Blå. This is a very cool area of Oslo to visit. It may be small but it’s just on the river and has a great arts vibe to it. 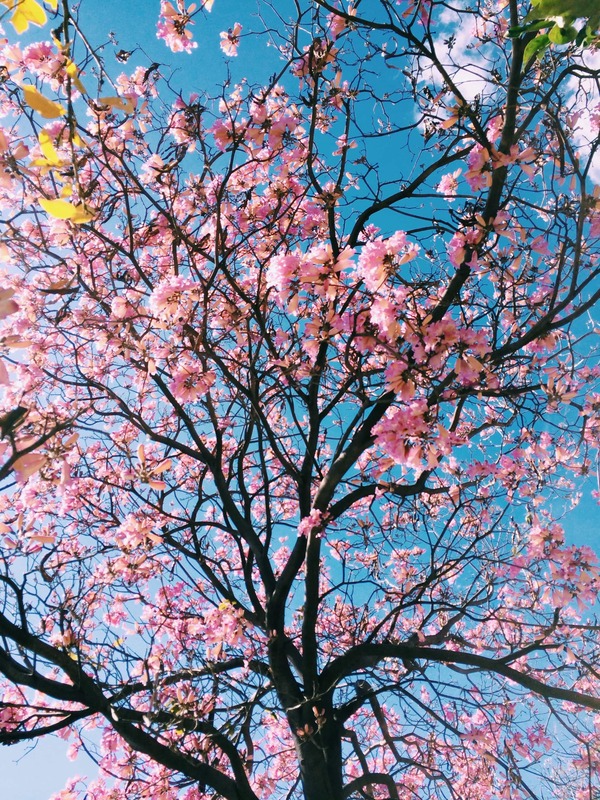 There’s a Sunday arts & crafts market with vintage clothes, live music, cool grafitti and more. 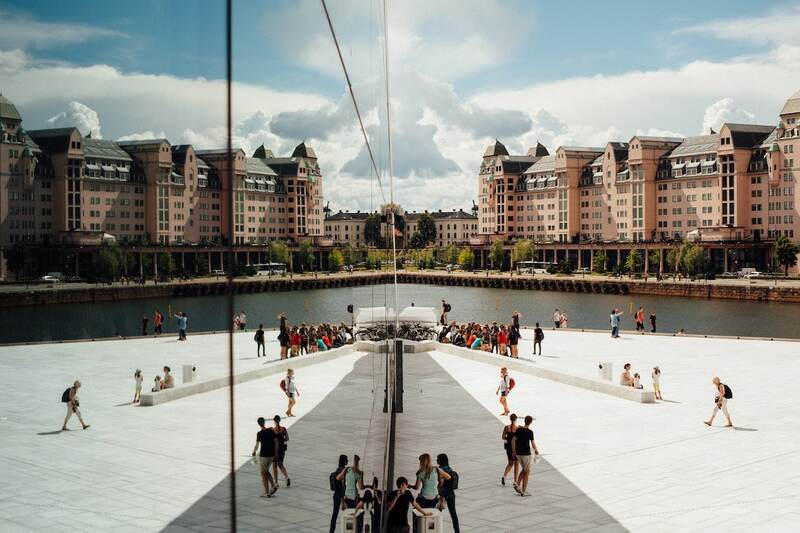 It’s a great place to spend a Sunday in Oslo as well as to do some people watching – one of the best Oslo activities!